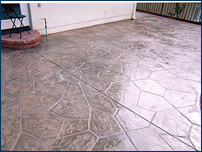 As it continues to increase in popularity, stamped concrete offers the opportunity to create an image of expensive materials and artistic quality at a fraction of the cost or time necessary when using other materials. 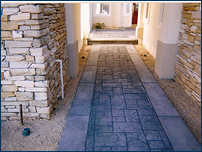 The imagination has no boundary when it comes to stamped concrete as the options continue to expand yearly. 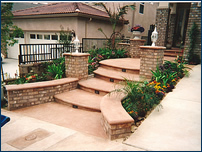 Any look, texture or color can be created to match or compliment any setting; as such communication with the customer every step of the way is critical in successfully achieving the customers’ goals. 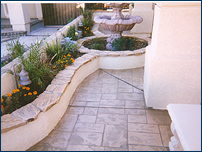 The possibilities are endless with stamped concrete; nearly every pattern you can imagine can be recreated. 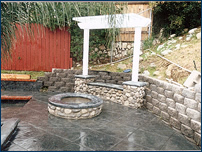 From interlocking patterns, such as cobblestone or flagstone, to multiple textures, such as wood grain, rough stone or slate, stamped concrete can recreate any look. 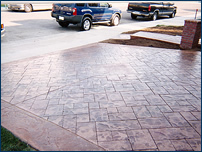 Further, with the addition of color hardeners and color releases, stamped concrete can be created to color match existing structures. 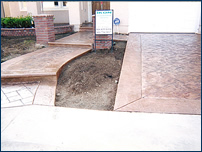 As an alternative to pouring new concrete, 1/4” overlays can be poured over existing concrete, ever increasing in popularity, this allows customers to get a new look and feel for their existing concrete without the hassle of demolition and a whole new pour. 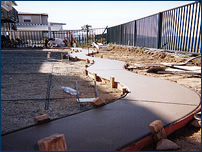 It is necessary for the existing concrete to be in good condition, it has to be able to provide structural integrity for the overlay. Because patterns are repeated, the use of ribbons and borders offers the opportunity to accent your patterns making the overall look more appealing. 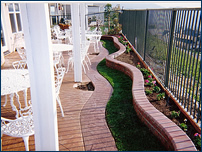 Often times these ribbons or borders can be colored in slight contrast for a more dramatic look of the overall project. 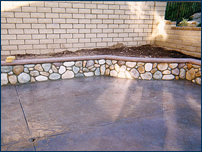 Columns, walls, and pool coping are all examples of concrete that can be poured directly into their final setting. 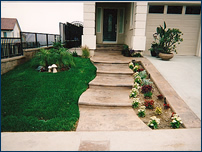 With the addition of bull-nose or cantilevers, you can further customize your concrete to meet your functional and artistic goals. 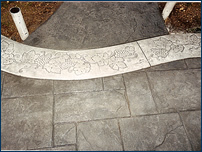 Utilizing concrete saws, designs can be cut right into concrete at varying depths. 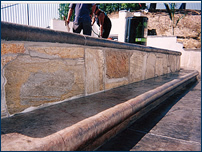 As a result, combined with variations in stamp, texture, color and stain, amazing results can be achieved. Saw cutting offers the freedom to be as creative as you can imagine at a fraction of the price necessary to produce the same results with more expensive materials. 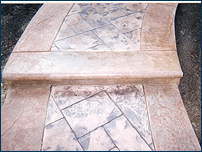 Sealing is a practical necessity for protecting your concrete however, with incorporating different finishes to further personalize your job; it has become another example of the continually expanding opportunity to customize concrete. 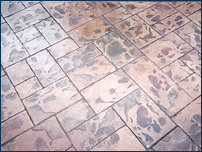 Examples of the different types of available finishes for sealers range from semi-gloss, to gloss, and even matte. 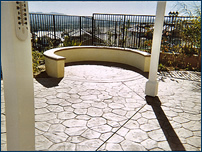 Choosing the right one is that final touch that will become the protective barrier for your concrete while it provides the lens through which everyone views your concrete. In the end, Ikon’s attention to detail and focus on constant customer communication are mainstays in achieving the type of success that we pride ourselves on. We want to know what you think as that allows us the best chance at delivering what you want.